Imagetripping sells beautiful framed distintive images of France, Alsace, Colmar and Riquewihr. Alsace is the European region with the greatest number of medieval feudal castles - more than 400 of them have been discovered to this day. A must see castles essential for the full Alsace experience is Haut-Koenigsbourg. Colmar, a town that is called Little Venice due to its enchanting canals and bridges loaded with colorful flowers. Colmar is also famous as a birthplace of Frederic-Auguste Bartholdi, world known French sculptor who created the Statue of Liberty. His museum is a must-see local attraction. 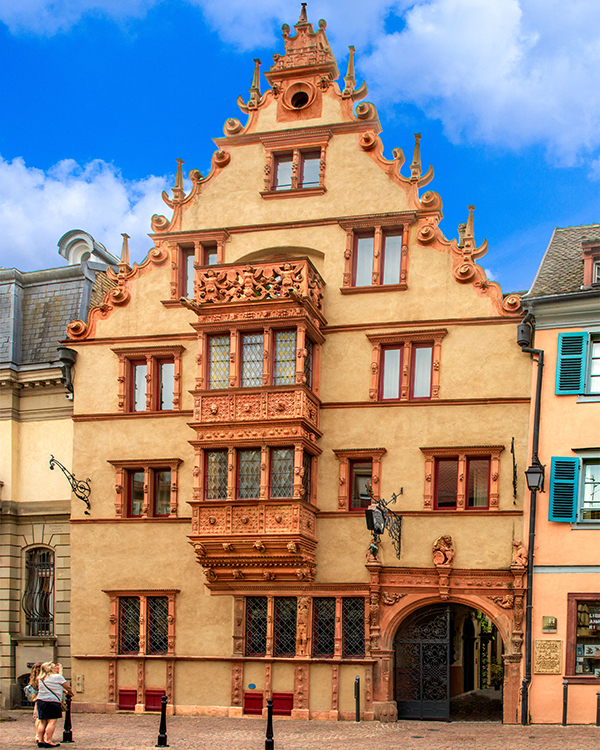 There are very distinct buildings including Maison Des Tetes-1609, Maison Pfister – 1537 (both German Renaissance). Alsace is also famous for its untouched nature. The best place one can enjoy in Alsatian natural history is the Natural Park Vosges du Nord located in the northern part of the Vosges massif and designated by UNESCO as one of the biosphere's world reserves. Haut-Koenigsbourg was built somewhere around 1147, on a 700 metres high peak of a mountain which proved to be the ideal strategic position for observing the Alsace plain stretching below it. During the Thirty Years’ War (1618-1648), the castle was conquered by the Swedish army fighting against Hapsburg monarchy, and was burnt to the ground. After that, Haut-Koenigsbourg stayed untouched and abandoned for more than 200 years, until 1865, when the ruins were bought by the nearby town of Sélestat. In 1882, the work on the reconstruction of the castle began but was forced to stop very early due to the lack of funding. In 1871 Alsace became a part of Germany and the city of Sélestat offered the castle ruins to Kaiser Wilhelm II. The German Emperor decided to proceed with the complete restoration of the castle as he wanted to mark symbolically his power over Alsace. He hired a German architect and archaeologist Bodo Ebhardt who rebuilt the castle after eight years of devoted work and thorough exploration of real life led in 16th century. After the Treaty of Versailles in 1919, the castle was once again in possession of France. In 1993, Haut-Koenigsbourg was classified as a historical monument. The castle, due to its quite isolated position and common sieges, owned its own windmill, animal farm and storage rooms with wine, wheat, and other groceries essential for the life inside of the walls. All of this can still be seen today. Riquewihr is located in the northeastern part of France and is only 7 miles (11 km) from Colmar and minutes from other Alsatian villages such as Ribeauvillé, Hunawihr, Eguisheim or Kaysersberg. The town is surrounded by its medieval fortifications and is overlooked by a castle from the same period that is today a museum. The medieval village is famous for Riesling and other wines produced in the village.